Intentional Deception | Wott's Up With That? “50,000 attend rally with speech against climate agenda in Poland“ (2013-11-12). Hey Anthony Watts, lately you’ve been frothing over “Warmist” exaggeration of Super Typhoon Haiyan fatalities. (Except it doesn’t look like there was any exaggeration, does it?) How does if feel being caught doing what you tried to accuse others of, in literally the same breath? Thanks to HotWhopper for unravelling this one: How’s That Polish Exaggeration Going, Anthony Watts? Anthony, your original title was “50000 at Rally Against Climate Agenda in Poland” and your copy-and-pasted post led with “UN climate summit in Poland greeted by 50,000 angry Poles rallying against UN”. You had to walk it back a bit, huh? A good match, ideologically, I guess. But if Anthony thinks he can pass off CFACT egging on far-right rioters as Poles throwing the oppressive yoke of UN climate scientists… I’ve got a bridge for sale in Brooklyn. 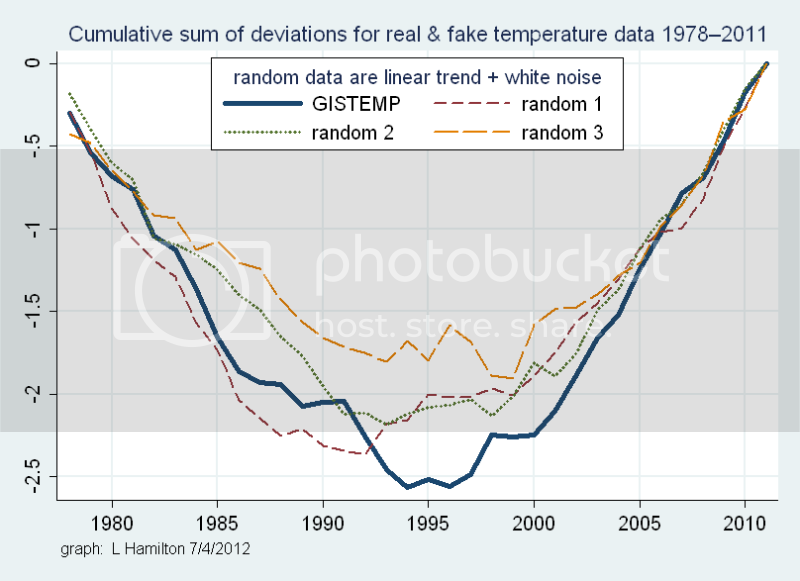 “Detecting regime shifts in climate data – the modern warming regime ended in 1997“ (2012-07-03). Anthony Watts blindly publishes another piece of scientific nonsense. Sam Outcalt, Emeritus (naturally) Professor of Physical Geography (naturally) has screwed around with Excel and discovered you can turn pretty much any data trend into a parabola that suits your goals if you just rescale things and only plot cumulative sums of deviations from average. 955 words and four references (do “personal communications” really count?) are all Outcalt needs to underpin his argument. I think Anthony’s denialist blog is the pinnacle of this “paper’s” trajectory. Outcalt is a retired permafrost guy, his last paper seems to have been in 1994. ‘Ads by Google’ helpfully suggests that “If you use a spreadsheet to manage work, you should watch this helpful 1 minute video.” Maybe the good Perfessor should take Google’s inscrutable advice? Update: Here’s a real temperature trend, from 1800 to 2010. Notice the lack of “regime change” in 1997? This data is from the Berkeley Earth Surface Temperature project, in which Anthony placed great faith until it didn’t give the result he wanted. He will publish literally anything with a “conclusion” that suits his agenda, even if he has no ability whatsoever to understand it. Perhaps especially if he doesn’t understand it. “Great paper. Thanks for re-posting this Anthony. Hurst makes perfect sense and it is well defended in the paper. I think Tamino is over his head with a paper like this. He posts new stuff so fast that by the time anyone intelligent can respond his mesmerized audience has forgotten about it other than a few unshakable rearguard commenters. Although they will all keep a vague memory of another perfect proof, probably contradicting earlier perfect proofs, that there is no global warming, which stopped in 1997 anyway. Not particularly clever, but effective if you lack peripheral vision. While I agree that the sun is going quiet, the ‘step change’ is spurious. It is mainly due to a sporadic, single magnetic storm in September 2005: http://hirweb.nict.go.jp/sedoss/solact3/do?d=2005%2c09%2c04 and here is the next rotation: http://hirweb.nict.go.jp/sedoss/solact3/do?d=2005%2c10%2c01 You can find many such steps. Such step changes happens all the time: http://www.leif.org/research/Ap-1844-now.png They are just weather, not climate. While I defer to Dr. Svalgaard’s overall superior knowledge on the dynamics of sun, and agree there are many sharp transitions in the Ap record, this looks to me to be a step change event of merit based on the factors listed above. I’ve yet to see a fully convincing explanation that this was a spurious event rather than a regime changepoint. But, I remain open to seeing such an explanation. “Sea Ice News #32 – Southern Comfort“. Anthony Watts tries to explain why he’s been avoiding the topic of Arctic Sea Ice. Apparently because the precipitous drop in Arctic Sea Ice, which Anthony is careful not to display until the end of his post, isn’t nearly as interesting as the statistically insignificant rise in Antarctic Sea Ice. Even though Arctic conditions are primarily affected temperature and Antarctic conditions are primarily affected by ocean currents. Cue bold-faced muttering about “healthy skepticism”, hidden data (oops! it was there all along) and wounded references to nasty scientists making accusations of breathtaking denialist ignorance. Oh, and apparently Tamino’s takedown amuses Anthony.